Courtesy of TOMLIN, ST CYR & ASSOCIATES LLC. 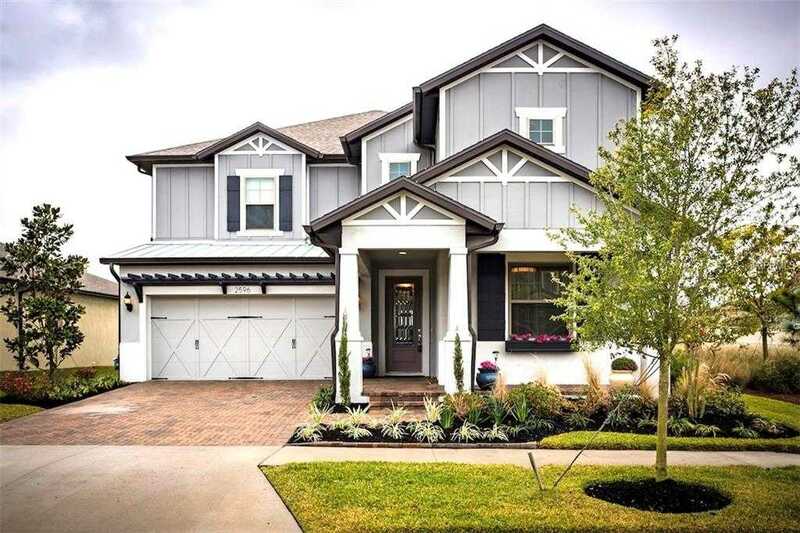 Located in prized Starkey Ranch, this 5 bdrm, 3.5 bath, 3320 sq ft, fenced-in backyard home is surrounded by parks, trails, pools & community amenities. Upon walking through the front door, the entry foyer greets you w/ reclaimed European oak ceilings, flooring and barn doors which create the excitement to see more. You will immediately notice a flex room (currently a gym) and formal dining room (currently office) that deliver natural light complimenting the elegant reclaimed woodwork. Moving past the formal dining rm, this stylish, high practical floor plan seamlessly connects the kitchen, living rm, and dining area. The kitchen does not disappoint with gas stove top, granite countertops, custom backsplash, lighting, and an abundant amount of countertop and cabinet space for all of your kitchen needs. Off the kitchen you find a WALK-IN pantry & office space with a built-in desk. The practicality of this space continues w/ a mud room equipped w/ stylish, useful cubbies. The cheerful living rm and dining rm complete the heart of this charming family living space. The second story offers solitude for the family with an open loft, 1 bdrm & bath to the left, 2 bdrms w/ a jack & jill bathroom, laundry rm and large master bdrm to the right. The master bdrm offers undisturbed tranquility that spills into the relaxing bathroom w/ double sinks, walk-in shower, & oversized closet. This well-designed home is situated in a neighborhood where community intersects with nature & amenities. Please, send me more information on this property: MLS# T3154562 – $455,000 – 2596 Whittler Br, Odessa, FL 33556. I would like to schedule a showing appointment for this property: MLS# T3154562 – $455,000 – 2596 Whittler Br, Odessa, FL 33556.